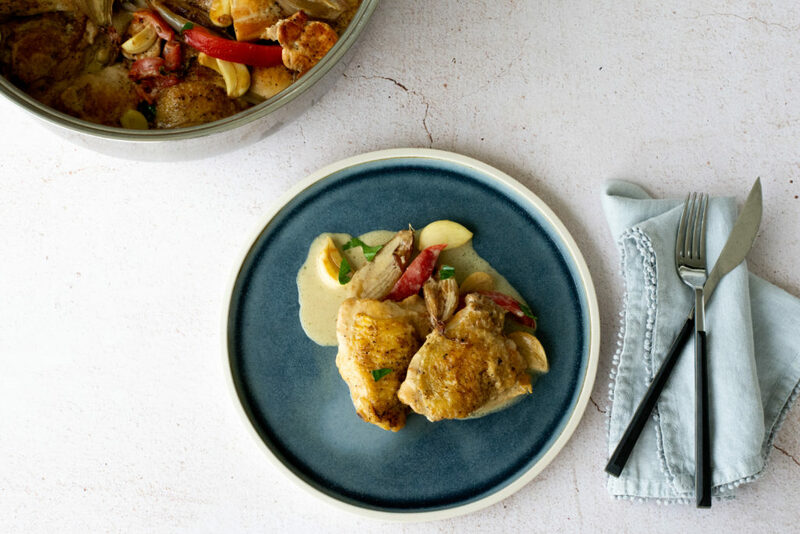 The beauty of cooking a humble ingredient such as chicken is that it’s used in pretty much all cuisines. I have prepared chicken with 40 cloves of garlic many times, it’s a French classic. 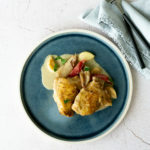 The other I picked up from a chef I had the opportunity to work with from Mougins, some years ago, vinegar chicken, another signature French dish. Here I have combined the two recipes, the sweet whole cloves of garlic and shallots, cooked in the chicken juices and then finished with a little creme fraiche is so delicious. It may seem like an awful lot of garlic but it mellows in flavour as it cooks. This dish can be prepared ahead and reheated when needed. Set the oven to 175C. Begin by cutting the shallots in half length ways, you don’t need to peel them, the beauty of cooking them this ways is the skin of the onion prevents it drying out and burning in the oven. In a roasting tin add two tablespoons of oil and heat on the hob, add the shallots, cook for several minutes then pop in the oven for 15 minutes. In the meantime dust the thighs with flour, shaking off any excess, season the chicken on both sides. Heat a deep frying pan with a tablespoon of olive oil and the butter, add the chicken, then the thyme and brown really well on both sides, place in a roasting tray and pop them in the oven while you prepare the sauce. Wipe the frying pan with kitchen roll to remove the excess fat but leaving any caramelised chicken bits. Now add the cloves of garlic and let them cook for a couple of minutes. Pour in the brandy, vinegars and sugar and let it bubble and reduce by half. Add the mustard and chicken stock and bring to the boil, simmer for a couple of minutes. Remove the chicken and shallots from the oven and place the thighs in the sauce in a single layer. 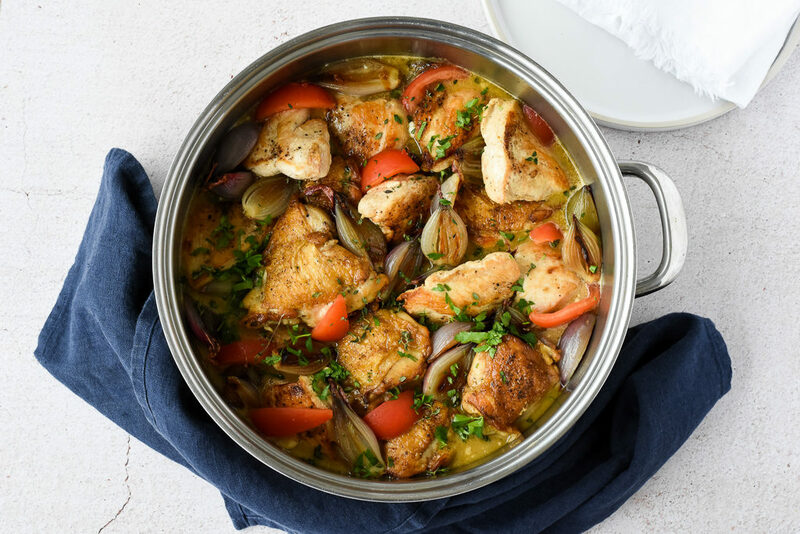 Remove the skins from the onions and add to the chicken, partially cover and let it cook for 25 minutes or until the chicken is cooked through, this will depending on the size of the thighs. Remove the thighs and shallots, place in a warm serving dish. Add the creme fraiche to the sauce and stir well and bring back to the boil and simmer for 2-4 minutes, add the tomatoes and check the seasoning. Pour over the chicken and onions, sprinkle with the parsley and serve. *How well you brown the chicken will affect the overall flavour of the dish so do this job very thoroughly. *If you like a slightly thicker sauce you can stir 1Tsp of cornflour with 2Tbls tablespoon of water and stir into the sauce when you add the creme fraiche. *You can use a combination of thighs and breast meat if you wish.